This past Saturday afternoon, my boyfriend and I drove to the old Naval Air Station in Alameda, CA and treated ourselves to a tour at St. George Spirits. 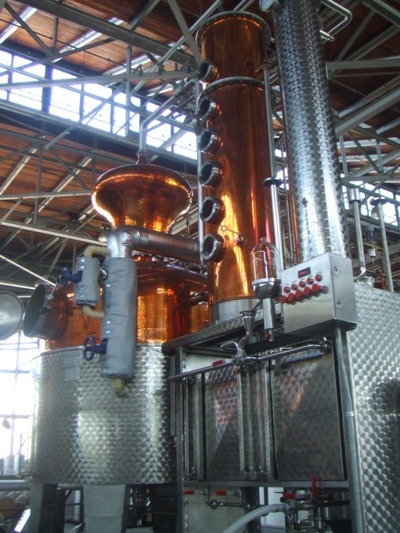 St. George Spirits was started over 25 years ago by a German man named Jörg Rupf, who had actually come to the States to be a lawyer. Thankfully, Jörg had a change of heart and went with was what in his blood – making great alcohol. “Standing in a California orchard more than 20 years ago, I was inspired by the perfect fruit around me to preserve its extraordinary quality in a brandy, or “eau de vie”. 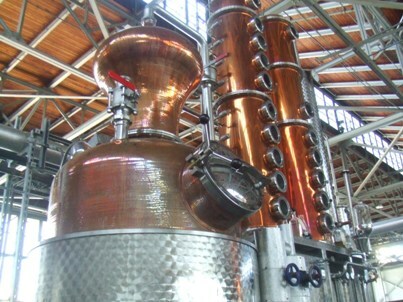 That was the beginning of St. George Spirits, America’s first distiller of true “water of life”. I set out to use the Old World methods I knew from my childhood in the Black Forest, and have constantly worked to refine them and to search out sources of delicious fruit. When my boyfriend and I first arrived at the Distillery, we were given a free taste of anything on their menu and chose the Aqua Perfecta Williams Pear Brandy. Um…..YUMMY! It seriously tasted like a fresh pear that was dipped in brandy. Our main reason for going to St. George Spirits that day was not for their brandy, however, but for their little tour during which we were going to learn about Absinthe and how they make it. Absinthe, as you may or may not know, was illegal in America until just two years ago. There are several reasons why the drink was taboo for so long, but none of them really matter anymore because now Absinthe is legal and St. George Spirits is an expert at making it. 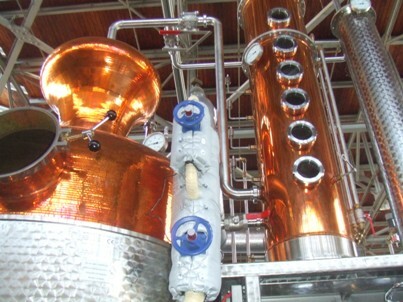 In fact, St. George Spirits was the first Distillery in America to be given the go-ahead from the Government in 2007 to produce and sell Absinthe. While we were learning about the distillation process of Absinthe we were lucky enough to taste it in various stages of production. It was fun to watch the expressions on the faces of those in the tour around me as they tasted the Absinthe for the first time; the drink it definitely an acquired taste. Absinthe tastes like black licorice so if you can’t stand that taste, you won’t be able to hang with Absinthe. After the tour my boyfriend and I participated in a ‘full tasting’ which we had paid for when we got to the Distillery. Basically we went down the list and tried everything. I seemed to have misplaced the list I brought home with me so I’m not positive of all the tastes we had. I’m pretty sure we tried more than that, but I can’t seem to remember at the moment. My boyfriend tried their Chipotle Vodka but I took one sniff and said no way. My favorites were the raspberry drinks. The Raspberry Liqueur tasted like candy and the vodka’s went down so smoothly it could really get you into trouble. The chick that gave the tour, Andie Ferman, was really funny and very enthusiastic; she clearly enjoyed telling us all about Absinthe. 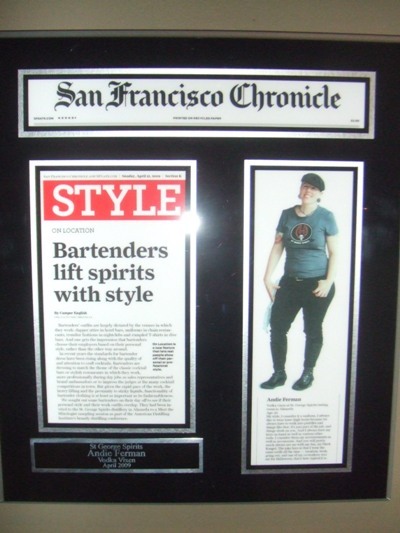 If you’re ever near Alameda, CA I demand that you visit St. George Spirits.